Not to be confused with Apostolic Christian Church (Nazarene). ^ "Church of the Nazarene". The Encyclopedia of Arkansas History and Culture. Retrieved 2014-06-23. ^ a b c d e f "Legislative Actions and G.S. Ballots – Nazarene Communications Network". Nazarene Communications Network. Archived from the original on 2011-07-26. ^ a b "Church of the Nazarene – Clergy Development" (PDF). nazarenepastor.org. Archived from the original (PDF) on 2008-04-11. Retrieved 2014-06-23. ^ "Stan A. Toler, "Report of the Board of General Superintendents to the 90th Session of the General Board, Church of the Nazarene", Lenexa, Kansas, 24 February 2013" (PDF). Retrieved 2014-06-23. ^ "Called unot Holiness" (PDF). Wesley.nnu.edu. Retrieved 2015-07-30. ^ "World Areas : Church of the Nazarene" (PDF). Nazarene.org. Retrieved 2015-07-30. ^ Charles R. Galley. "Internationalization in the Church of the Nazarene" (PDF). Nazarene.org. Retrieved 2015-07-30. ^ M. E. Redford. "The Rise of the Church of the Nazarene" (PDF). Wesley.nnu.edu. Retrieved 2015-07-30. ^ a b "History of Nazarene Polity" (PDF). nazarenepastor.org. Archived from the original (PDF) on 2008-04-11. Retrieved 2014-06-23. ^ "Bowling rescinds election as GS". ncnnews.com. 2009-07-02. Retrieved 2014-06-23. ^ a b "Top 100 Churches in 2014 Worship Attendance" (PDF). Nazarene.org. Retrieved 2015-07-30. ^ "Mission Structure Revision". globalmission.nazarene.org. Retrieved 2014-06-23. ^ "Nazarene Communications Network". ncnnews.com. 2008-02-08. Retrieved 2014-06-23. ^ "NMI: Nazarene Missions International information". Home.snu.edu. 2014-04-21. Retrieved 2014-06-23. ^ a b c d e "Stan A. Toler, "The Radical Optimism of Grace", Report of the Board of General Superintendents to the 90th Session of the General Board, Church of the Nazarene, Lenexa, Kansas, 24 February 2013" (PDF). Retrieved 2014-06-23. ^ "Nazarene Compassionate Ministries". ncm.org. Retrieved 2014-06-23. ^ "Retrieved 18 March 2009" (PDF). Retrieved 2014-06-23. ^ 2002–2012 Andrew Maltsev, 2012–2013 Derek J. Curtis. "Beacon Hill Press of Kansas City". isbndb.com. Retrieved 2014-06-23. ^ Thomas Jay Oord. Biography · For The Love of Wisdom and The Wisdom of Love. thomasjayoord.com. Retrieved 2014-06-23. ^ Rearick, Ann Cubie (2001). "A Nazarene Mother Teresa in Boston: Esther Sanger". In Wiseman, Neil B. Architects of the Enduring: Uncommon Stories from Everyday Nazarenes. Beacon Hill Press of Kansas City. pp. 129–131. ISBN 978-0-8341-1897-3. ^ "Denomination and style at averyfineline". averyfineline.com. Retrieved 2014-06-23. Smith, Timothy L. "Internationalization and Ethnicity: Nazarene problems and Accomplishments" (PDF). Nazarene.org. Retrieved 2015-07-30. 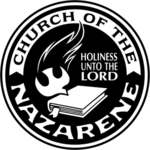 Wikimedia Commons has media related to Church of the Nazarene.